TWO more highly regarded youngsters are without a team. The pair of Ronald Pascual and Roy Sumang found themselves released by Blackwater to the free agent pool with just three days left before the new season of the PBA fires off at the Smart Araneta Coliseum. 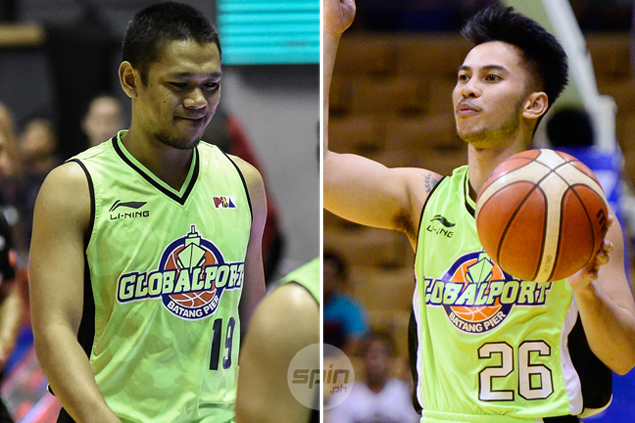 Pascual, 28, and Sumang 25, both have live contracts with the Elite, but failed to make the team’s 15-man roster with the late acquisition of veterans Ronjay Buenafe and Dylang Ababou. Pascual was no longer included in the initial lineup submitted by Blackwater during the press launch of the league’s 42nd season. Sumang followed suit when a revised roster was forwarded to the league office on Thursday. A top official of Blackwater confirmed to SPIN.ph the team’s move to relegate the two young players to the free agent list. Both Pascual and Sumang though, still joined Blackwater’s two-day team building held at the Discovery Suites. The two players were full of promise when they entered the league one year after the other after glowing impressive college careers. Pascual obviously had the better credentials. The native of Mexico, Pampanga comprised one-third of the celebrated “Pinatubo Trio’ of San Sebastian College that also included Calvin Abueva and Ian Sangalang. He was the No. 3 overall selection of San Miguel in the 2014 draft and part of the team that won the Philippine Cup and Governors’ Cup championships. But he never really cracked the Beermen’s rotation and found himself shipped to Star in his sophomore year as part of a complicated, six-player, four-team trade. The stint with the Hotshots also didn’t last long as Pascual was again sent packing for Globalport, and later to Blackwater in a one-on-one trade with Mike Cortez. Sumang, a native of Tondo, Manila, was a highly-touted guard out of University of the East, who’s a projected first round pick in the 2015 rookie draft. To the surprise of many, teams passed up on him until Globalport tabbed him with the 26th overall pick when the franchise found him still available in the third round. Despite getting a lucrative contract from the Batang Pier, the union proved to be short-lived as Sumang was included in a three-team trade that landed him at Blackwater late in the mid-season Commissioner’s Cup.